No smile is perfect, but if you’re unhappy with the way your smile looks, it could be impacting your confidence and social interactions. Cosmetic dentistry could help you achieve a confident smile that reflects your inner self. Dr. Zachary Held and his team are passionate about helping patients gain winning smiles through high-quality, personalized dental care. Combining experience with artistry, Dr. Held provides custom cosmetic services to patients across the Indianapolis communities. Are you ready to show off your best smile yet? Make an appointment with our welcoming office today! What are My Cosmetic Dental Options? Our office provides a wide array of cosmetic dental options, so you can choose the approach that best meets the needs of your smile. There is a cosmetic dental procedure for just about every dental aesthetic issue you might have. From chipped teeth to discoloration and misalignment, cosmetic dentistry can address your issues and help your smile look natural again. How Do I Know if Cosmetic Dentistry is Right for My Smile? The first step in deciding on your dental treatment is evaluating whether you have any underlying health issues. If your smile is unhealthy, a cosmetic fix will only hide the symptoms and won’t provide lasting results. Our dentist is careful to address any health issues before recommending cosmetic treatment for your smile. Once you’ve established a healthy foundation for your smile, we can recommend cosmetic options. We take the time to listen to you and understand your smile goals, which helps us to design a smile that reflects your personality and is flattering to your features. Still Not Sure about Cosmetic Dentistry? These 5 Questions Might Help You Decide! Am I happy with my smile? Am I confident smiling in social settings? Do I like seeing my smile in photos? Do I ever hide my smile out of embarrassment? If I could change anything about my smile, what would it be? 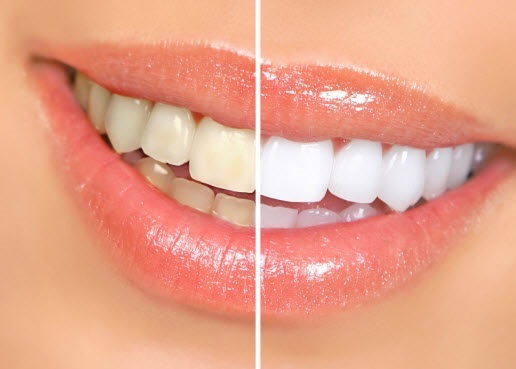 One of the simplest and most effective ways you can enhance your smile is with teeth whitening! A single office may be all you need to lift years of stains off your enamel and restore your teeth to their natural shade. Fast: A single session usually takes an hour or less to complete. Effective: Thanks to the professional-strength bleaching gel, in-office whitening can lift years of set-in stains, making teeth up to 7 shades brighter. Safe: A dental professional will monitor your treatment to ensure even results and minimize sensitivity. Long-lasting: Professional whitening eliminates stains that have built up over the years, and with proper care, the results can last for years as well. How Does Professional Whitening Work? During your whitening visit, we begin by showing you where your teeth rank on a color chart. Once you are comfortable, we apply protection for your gums to minimize sensitivity, then apply the gel. Typically, the gel is applied in three 15-minute sessions with a short rest in between. Once the process is complete, we’ll show you how you rank on the color chart again so that you can see the full effectiveness of your treatment. Bonding, Veneers, and Crowns: Which One Should I Get? 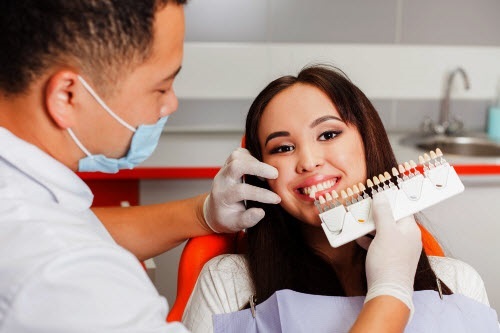 Bonding, veneers, and crowns can all be used to address a variety of situations, and sometimes it can feel confusing about which one is right for you. Typically, the dentist will make a recommendation depending on the particular cosmetic issue, the location of the teeth involved, and your smile goals. If you’re trying to decide between multiple options, it may help to know more about what each treatment has to offer. What Does Dental Bonding Fix? While bonding is less durable than veneers or crowns, with proper care, your bonding can last for many years. Avoid putting extra stress on your bonding by biting down on hard substances, such as hard candy or ice cubes. You should also never use your teeth as tools to cut or tear things, especially biting your nails. Practice proper hygiene by brushing twice a day and flossing daily. If you’re prone to clenching or grinding your teeth, try to limit this habit and reduce triggers such as stress. If you grind your teeth at night, talk to the dentist about whether you need a dental appliance to protect your teeth and dental work. How Do Dental Veneers Enhance my Smile? These thin porcelain shells can accomplish a lot with your smile. Veneers attach to the front surface of your most visible teeth, concealing several dental imperfections. Veneers last an average of ten years, and because part of the enamel is removed to make room for them, they will need to be replaced. With proper care, you can make sure your veneers last as long as possible. Always practice good hygiene and avoid biting hard substances or using your teeth as tools. Veneers are resistant to stains, but cannot be whitened once they are placed. If you plan to whiten your teeth, it’s recommended that you have it done before getting veneers. Are Porcelain Crowns Good for Enhancing Teeth? Crowns are known as much for their durability and long lifetime as they are for their aesthetics. Designed to withstand everyday chewing pressure, crowns can be used on any tooth as long as there is enough enamel to support it. Which is Better: Porcelain or Porcelain-fused-to-metal Crowns? Both types of crowns provide aesthetic benefits as well as protection, but there are pros and cons to each. Consider these qualities of each type of crown, and talk to the dentist to determine which one might be right for you. Porcelain crowns are more translucent and appear more natural. Porcelain crowns are more difficult to place. Porcelain-fused-to-metal crowns are stronger and last longer than pure porcelain. Porcelain-fused-to-metal crowns gradually create a dark line at the gum line. Porcelain-fused-to-metal crowns typically cost less than full porcelain crowns. Should I Get a White Filling or a Metal One? Metal (amalgam) fillings have been used for decades, but newer composite (white) fillings are becoming more and more popular every year. Composite fillings offer several benefits over their metal counterparts. Beautiful: Composite fillings blend in perfectly with the surrounding enamel, and are almost impossible to see. Conservative: White fillings bond to the enamel, and can fill smaller spaces so that less of your enamel has to be removed. Healthy: Metal fillings use mercury to bond the metals, but white fillings are 100% free of heavy metals. The main advantage of metal fillings is that they are more durable than metal fillings. However, better materials and techniques mean that composite fillings are becoming stronger every year, and can last a decade or longer on average. If you didn’t have braces as a child, you may be considering your teeth and wondering whether they’re worth it today. The answer most likely depends on how significant your misalignment is. If all you have is a gap or one or two slightly crooked teeth, these issues can be corrected by a simple cosmetic treatment. If your alignment is more complicated – such as crowding or severe bite issues – there could be serious long-term consequences. A misaligned bite is more than a cosmetic issue. When teeth don’t meet properly, they wear each other down, resulting in tooth pain, headaches, and other complications. They’re also harder to clean and more vulnerable to cavities. 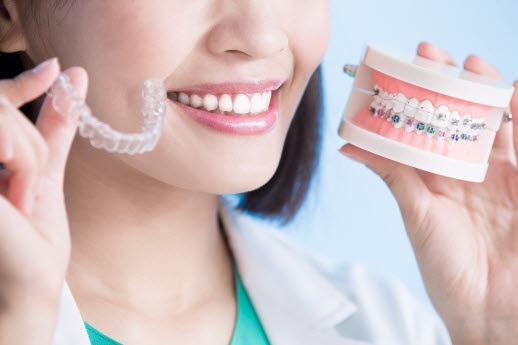 Braces help to put your teeth into proper alignment, so that you can speak, chew, and digest better, and keep your teeth healthier in the long run. It’s understandable that some people may be reluctant to get braces because of how they look. Fortunately, you may have options today with clear braces. Clear braces come in two different types. Ceramic braces use brackets and wires like traditional braces, but the brackets are tooth-colored or clear, so they stand out much less. Clear aligners, on the other hand, are thin plastic trays that fit over your teeth and guide them into position with gradual pressure. Can I Use Clear Braces? Whether clear braces are better for your smile depends on your unique case. Clear aligners are useful for mild to moderate alignment issues, such as gaps, crowding, and crooked teeth. They’re also considered safer, especially if you are active or involved in contact sports. If your case is more extensive, ceramic braces may be the better option, as they can shift your teeth more quickly and more effectively. When you come in for an evaluation, the dentist will talk to you about what is needed to straighten your smile and which options will work best for your teeth. Ready to Enjoy a More Attractive Smile? With cosmetic dentistry, the smile you’ve always wanted could be within your reach. At Dr. Z Dentistry, we love helping our patients achieve smiles they can enjoy for a lifetime, and we’re excited to help you do the same! Contact our office and make an appointment today to see how cosmetic dentistry can benefit your smile!